Read our Flip Book to discover some of the things that saw on a recent field trip in our locality. 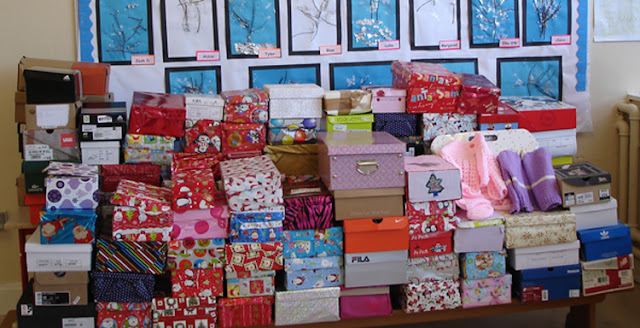 Scoil Eoin Student Council organised a Christmas shoebox appeal to help people who aren’t as lucky as we are. Team Hope the charity involved has a warehouse in Dublin where they store the shoeboxes before they are shipped abroad. We were encouraged to try our best to bring in an item or two to put in a class shoebox or you could do a full one by yourself. We were asked to include something to wash with, something to write with, something to wear and something with the wow factor e.g. a small toy, a packet of sweets etc. Romania, Czech Republic, Armenia and Moldova. Others will be going to African countries such as Rwanda, Kenya, Swaziland, Congo and Burundi. We are so happy to say that ALL of the pupils in Scoil Eoin participated in some way. We have received 92 shoeboxes! We are so pleased with ourselves. In class we watched a video which shows us how delighted and excited the children are when they receive their shoeboxes. After all, it’s more than likely the only Christmas present that they will get. So that’s why we now appreciate what we have and don’t take it for granted. We really hope to participate in the Christmas shoebox appeal next year! In a dull, old town on a cold, snowy evening, a young girl went skipping along down the street. Suddenly, she stopped and in front of her she saw a large chalkboard with hundreds of names written on it. She reached into her jacket pocket, and took out a piece of chalk. The little girl found an empty space and among the many names she wrote her name Alma. Alma gawped at all the names, when suddenly, she heard a noise. Alma turned to see a big window with a doll inside. She walked over to get a closer look. It almost seemed like staring at her reflection. Alma rubbed her eyes. She looked back and the doll was gone. Alma thought this was very strange. She tried to open the door. It was locked. She got annoyed and threw a snowball at the door. She began to storm off, but she heard the door open. She went inside, she saw the doll that she had seen in the window on a large table. Alma began to walk over, when suddenly she knocked over a doll on a bicycle. She put him back up right. It began to cycle towards the door, when it got quite close the door slammed shut! He seemed to want to get out. Alma turned back around, the doll had moved again! This time it was on a tall shelf. She went and pulled over a chair. Alma stood up on the chair. She reached up for the doll. She was almost there. There was a flash. She seemed to be sitting on the shelf. She couldn’t move a muscle. It suddenly dawned on her, she had turned into a doll. This video shows how Google collects images for street view. It shows you how they get to places where cars can't go.